This is my new favorite golf shirt. I'm not one for sporting the logos of popular golf brands like Titleist or Callaway. (Not unless they are paying me.) I'd much rather brandish the colors of my favorite sports teams. And I'm a diehard Rockies fan! 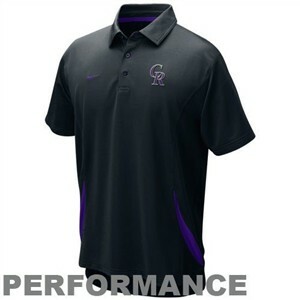 I like this Colorado Rockies golf shirt because it is made out of my favorite material: Nike's trademarked Dri-FIT material. This stuff is the best of any I've worn. All the top brands have their own version of the light, moisture-wicking material, but none are as good as Nike's Dri-FIT. I like the Dri-FIT the best because of how it feels. It's very light and very soft. Many of the other brands feel coarser almost like polyester. In addition to staying dry on a hot muggy day, I like how the shirt moves with you as you swing the club. It's a completely different feel then when I wear a regular cotton shirt. Speaking of cotton, I've even been chafed around my arms after a particularly hot day playing with a cotton shirt on. I've sworn off wearing cotton altogether for golfing. You can buy any sports team; you don't have to get The Rockies. And of course, you can just get a striped Nike Dri-FIT.